Athens is declared Capital of Greece according to the decree issued by the under-aged King, Otto - who fulfills the wish of his father, King Ludwig I of Bavaria. Anargyros Petrakis is elected the first Mayor of Athens. The National Bank of Greece is established in Athens, with its main function and goal being the financing for the growth of agriculture and system of government. 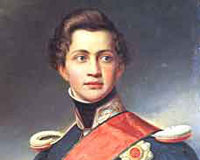 On September 3, 1843, a revolt breaks out primarily demanding the concession of the Constitution by King Otto and the establishment of Constitutional Monarchy. Finally, the Constitution is conceded but is conservative character, since the King continues to have all real power under his control. The British Fleet blockades the Port of Piraeus with the excuse of the destruction of the household goods of the Jewish-British citizen, Don Pacifico, etc., with the real reason being the reaction of Great Britain to Otto΄s policy. The British-French Fleet seizes Piraeus and reaches Penteli and Patisia, due to the support of freedom fighters in the Ottoman Empire during the Crimean War. Simultaneously, a cholera epidemic breaks out taking with it 3,000 victims. An uprising against Otto breaks out, with the final result being his fall and the creation of a temporary government. Bloody conflicts take place asserting political power. Peace comes with the arrival of King George I in Greece. The crisis surrounding the "Lavriotiko" issue increases. 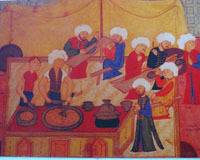 This issue led to the ruins of many small depositors. A period of growth for the city. The contribution of Harilaos Trikoupis is very great and leads to his becoming Prime Minister in 1882. 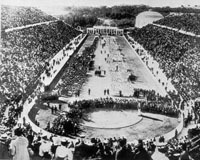 The first modern Olympics take place at the Panathenaic Stadium of Athens. Spiros Louis΄ win at the marathon run stands out.